Looking for a treat for a child this Easter that's not chocolate or egg shaped? How about something sticky, icky and encased in a black bin liner? Rubbish is inspired by the treasures that lurk in our bulging bins. It's a beautiful blend of human and puppet action, where bin contents come alive as a kooky team of 'excavators' rummage through a towering pile of rubbish-stuffed black bags. Not shy of tackling serious subjects for young audiences – its last one was about the banking crisis – Theatre Rites' latest show is about the importance of reusing and recycling, though the message is subtle. As the excavators delve into various bin bags, they set a gaggle of characters free. Constructed from some rather attractive rubbish – we would happily take home the brown leather lace-up boots and the Falcon enamel colander if anyone's offering – the objects are brought to life with some seriously good puppetry. There's a lisping, laughing duck made from a jug, a mop of a dog with a bottle nose and tennis ball feet, and a light-headed man, who is as tall as he is mysterious. A highlight is the tiny figure magicked out of a yellow gloved hand. The puppeteer is dextrous, able to shape his hand into a human and keep it like that for some time. The tiny person walks through a tabletop cityscape of suitcases and into a shadowy forest of brooms, where he ice-skates on a silver tray. Rubbish is enjoyable for grown-ups but how about the kids? Featuring a dash of the obligatory audience participation they so seem to love, some gunky black ooze that makes them squeal, and a lively theme song that gets everyone clapping, this is children's theatre at its best. Never patronising or sentimental – in fact, decidedly eerie at points – it's a delicious Easter treat for everyone seven and over. Londonist saw this show on a complimentary review ticket. 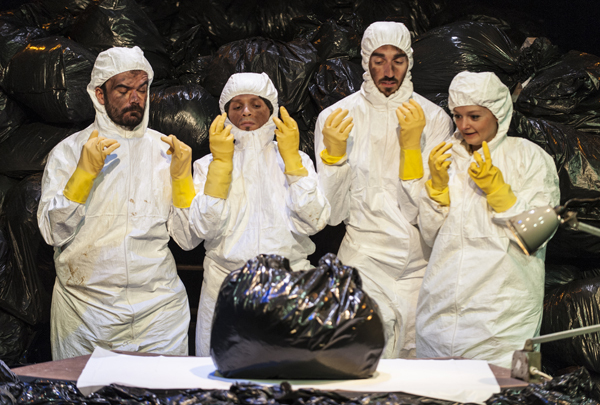 Rubbish by Theatre Rites plays in the Purcell Room at the Southbank Centre until Mon 21 April. See also: London in the Easter holidays.